A pane with Grid master and hierarchy objects - in this pane you can add/remove detail tables. A pane with properties for the selected object. The screenshot below shows the initial state of the Telerik RadGrid editor's General Settings page. This page provides options that if set, will be available for all grid tables. If you set [Show header] option, all tables in your grid will have headers. 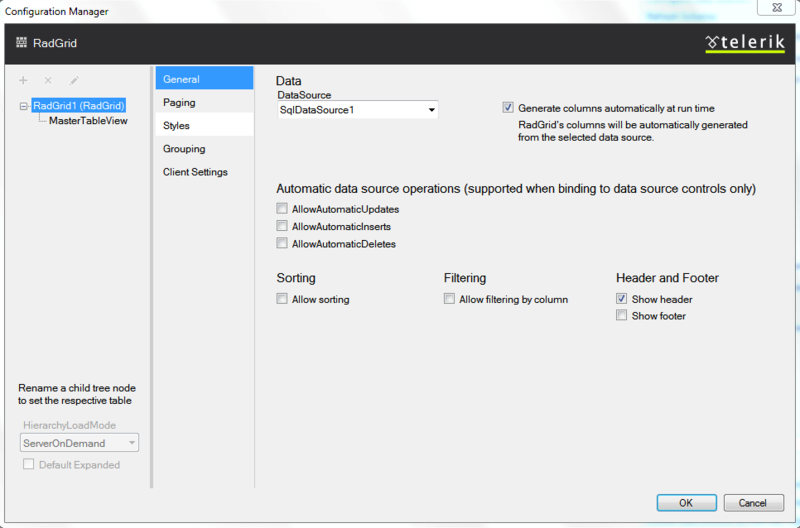 DataSource Sets the DataSource property, specifying the data-source object that will be used for building the grid. If you have set a dataSet, it will appear in the drop down list. Generate Columns automatically at runtime All columns, available in the specified dataSet will be generated as GridBoundColumns at runtime. This option sets the AutoGenerateColumns property to true . Use the check-boxes to perform the required operations(insert/update/delete). You must configure the data source so that it supports the automatic operations. Check the box to enable the data Sorting option. When this option is enabled, the Header cell for each column will be a link and will sort the data. Check the box to enable the data Filtering option. Use the check-boxes to enable the Header or Footer cells.